With the second round of the Olympic spectacle now opening as the Paralympics this week a London comrade reflects on what it says about modern capitalism. If the London 2012 Olympic opening ceremony was at times reminiscent of Hitler’s Nuremberg rallies, perhaps it was because much modern Olympic imagery originates from the 1936 Berlin Olympics which were staged as a showpiece for the Third Reich. It was for these games that the Olympic torch relay was first invented, with a succession of ‘Aryan’ looking athletes carrying the flame from the ruins of the Temple of Hera in Athens all the way to Berlin. And it was at the Berlin games, if not before, that it became clear that the main purpose of the Olympics, particularly for the host nation is national prestige rather than sport. Fast forward to London 2012 and the British media subjected us to a fortnight of patriotic fervour not seen since the Falklands War. The exploits of Team GB dominated every news bulletin almost to the exclusion of anything else. For that glorious two weeks it was as though unemployment, low pay, and cuts in public services had been abolished. Indeed the happy children bouncing up and down on NHS beds at the opening ceremony indicated that all was well in the NHS. Athletes became ‘our heroes’ a term normally reserved for the military, but unlike the soldiers who are just getting blown up in Afghanistan for no obviously discernable reason, Team GB were actually getting results. And just like in a war it was the workers who were asked to make the sacrifices for the benefit of the Olympics. In an unprecedented move, ground to air missiles were located on the roofs of local authority housing tower blocks in order to protect the games against potential terrorist attacks, making the tenants potential targets. Strangely nobody suggested that the missiles might be put on the roof of the HSBC Tower or any of the other nearby temples of capitalism at Canary Wharf. Londoners were told to change their working patterns or take annual leave so that IOC officials could speed unimpeded along designated Olympic lanes from their five star hotel in Park Lane to the Olympic Park at Stratford. Potential protestors were warned of robust police intervention and stiff penalties if they dared to voice any dissent against the circus and thousands of troops were employed to provide security for the games. Three hundred ‘branding police’ were brought in to protect the branding of the Olympic sponsors. This was most extreme copyright enforcement ever at the Olympics with words such as ‘gold’ ‘silver’ and ‘bronze’ being regarded as words that infringe the copyright of the corporate sponsors. This enforcement was taken to absurd extremes when a local café called the ‘Olympic Café was forced to change its name, and caterers at Olympic venues were prevented from selling chips as this was deemed to be in breach of MacDonald’s corporate sponsorship agreement. But an event on this scale has to be planned properly and the sport itself was great…wasn’t it? Well we certainly don’t want to denigrate the achievements of individual athletes, British or otherwise (although you cannot help wondering how much success was “chemically assisted”). However when you look at the medal tables it is clear that the most successful teams were the teams with the largest numbers of athletes (Team USA had over 500) or the teams with the greatest amounts of investment and financial sponsorship. Team GB coming third after the USA and China (although Russia had a higher total number of medals) clearly did pretty well against countries of six times and twenty times its population, but success was largely concentrated in sports such as cycling, rowing and sailing where substantial investment in technology can make a significant difference to the outcome. So not exactly a level playing field then, the Olympics are largely a sporting reflection of the imperialist relationships between the nations of the world. And the Paralympics will be even more so given the cost of the hi-tech equipment the athletes use. The Olympics are costly, so costly in fact that it is unlikely that we will ever know how costly they have been. 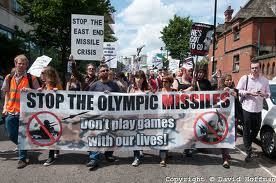 At least £9bn of public money has gone into the games from UK taxpayers and London Council Tax payers. We are told that it is worth it because the Olympics generate money from tourism and orders for British firms although these sums never seem to be quantified. Moreover we are told that the Olympic Park development will be a catalyst for the regeneration of one of the poorest areas of London. The reality is that like in most other Olympic cities, working class people were kicked out to make way for the Olympic Park, and that any regeneration that does occur will not be for the benefit of workers, who will not have the money for the new homes created in the Olympic Village and elsewhere save for a handful of tokenistic ‘affordable housing’ units. Some claim that the Olympics have inspired many young people to take an interest in and participate in sport. However to the extent that interest has been generated, it is unlikely to be matched by the provision of new sports facilities. Sports funding is likely to continue to be focussed on the elite athletes who will bring more victories for Team GB in future events. Funding for community sports facilities is likely to decrease. Once the ‘feel good factor’ and the national pride has dissipated as it will do within a few weeks, the main legacy of the Olympics is likely to be debt. This has been the experience of other countries; it took Montreal which hosted the Olympics in 1976 thirty years to repay the debt and even Jacques Rogge, the head of the IOC has commented that the $15bn spent on the 2004 Athens Olympics was a contributory factor to the Greek financial crisis and accounts of 2 –3% of the country’s debt. At the Olympic closing ceremony John Lennon appeared on a giant video screen singing “Imagine there’s no countries’. In an event defined by nationalism and flag waving, the astounding hypocrisy of the Olympic organisers in playing that song beggared belief. We look forward to a time when athletes from around the world will gather together in an event of sporting excellence, but they will not be there to represent countries and the corrupt and exploitative governments that rule them. Alas this will not happen until we have created a socialist world.